According to my archives, last night was my third encounter with jazz pianist Adam Shulman (pictured above) at the Hotel Rex presenting a one-hour Salon series recital for San Francisco Performances (SFP). At my first encounter, which was in April of 2014, he led a trio with John Wiitala on bass and Smith Dobson on drums to wind up that season’s Salon programming. 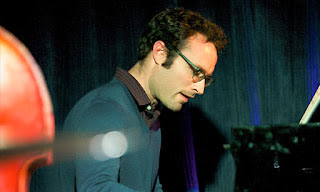 The following November Shulman returned to accompany trumpeter Sean Jones, who was giving his first performance in his new capacity as jazz Artist-in-Residence. Last night Shulman returned to the Rex for another trio gig. Wiitala was again on bass, but this time the third member was Lyle Link playing alto saxophone and taking one tune on soprano saxophone. The program sheet described the event as “an evening of the Great American Songbook.” However, allowing for all of the impressive and extensive improvisation work, an hour was barely enough time for only six numbers; and half of them were by Shulman himself. This was far from a problem. Shulman is as imaginative in coming up with tunes as he is in improvising on them, and the other trio members had no trouble working with his material. He also disclosed what I found to be a throughly engaging approach to invention. Reader’s may recall my having written about Frank Tirro’s “silent theme” thesis, according to which many bebop “originals” were products of elaborate embellishments of older favorite tunes. (The best-known example is probably Charlie Parker’s “Ornithology,” whose “silent tune” is “How High the Moon.”) Listening to Shulman’s own pieces, it struck me that he, too, was drawing on older favorites. However, rather than “disguising” them with thick embellishment, he would simply pick up the incipit, tweak the tempo, and then point it in an entirely new direction. Thus, when listening to Link play the first statement of the tune for Shulman’s “Full Tilt,” one could almost think that he had started to play John Coltrane’s “Giant Steps” and then decided to play something else. The wide descending intervals were still there, but they bounced around to a more eccentric beat and almost immediately staked out new territory. Another possible source was even more surprising. Shulman wrote “Katy” for his girlfriend (or so he said). This left me wondering if she was a dancer, because, in this case, the incipit seemed to come from the “Flowers” waltz music that Pyotr Ilyich Tchaikovsky composed for the second act of the ballet The Nutcracker. Needless to say, any resemblance to Tchaikovsky was held off at football-field length; but the incipit spoke for itself as Shulman guided it off into another field. Link took out his soprano saxophone for “The Peacocks,” a piece by Jimmy Rowles that was first recorded by Stan Getz on an album of the same name. Link clearly had his own approach to conveying bird-like connotations, although those who really know their Maurice Ravel scores will probably always find it hard to shake the haunting quality of the bird’s call that must be summoned up by a soprano vocalist. Rowles took the “middle ground” of the three “songbook” composers, much younger than Cole Porter and slightly older than George Shearing. Shulman opened with a Porter rarity, “Dream Dancing;” and it is always fun to encounter an unfamiliar piece by a familiar composer. At the other end the program concluded with Shearing’s “Conception.” This was also the title of the Prestige album that Miles Davis released after having recorded Birth of the Cool. Shearing’s piece was one of the tracks. Shulman’s decision to close with it reminded jazz lovers of just how broad Shearing had been in the music he created and how amenable his tunes have been to adventurous interpretations by others.